Hello, my friends! I'm so excited for the release of my very first book! I've finally been able to set up pre-orders. The release date is January 1, 2014. If you'd like a copy, autographed by yours truly, check out the info posted below (or you can click on my book in the right sidebar of this blog.) Once I receive my shipment of books, I'll be signing them and shipping them out, as fast as I can. Won't you join me in doing a little happy dance?! This is the jewelry making book you've been waiting for! The Jewelry Maker's Design Book will show you how to combine excellent technique with brilliant design, to create gorgeous, one-of-a-kind pieces of found object jewelry. You'll be guided through the design process with plenty of step-by-step technical instruction and big, beautiful photographs. Unlike other jewelry making books, this book will instruct you in the nuances of outstanding jewelry design. The Jewelry Maker's Design Book covers the elements and principles of design that you need to create unique and fascinating pieces. Also included are lots of technique, and tips and tricks for finding, storing and using beads, stones and found objects as well as how and why to keep a jewelry journal. This book will inspire your designs to a new level of quality and creativity and show you the alchemy of using found objects in your work. 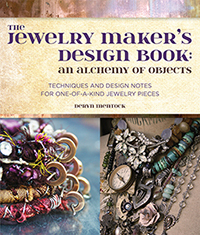 Find your inspiration, while developing amazing design skills with The Jewelry Maker's Design Book: An Alchemy of Objects! Order your copy now and receive a book signed by me! The book is set for release Jan. 1, 2014. Signed copies that have been pre-ordered will be sent out after that date. Originally from Oregon, with a stop in Wyoming, Deryn Mentock got to Texas as fast as she could. There, she wrangles a husband, two young men, an energetic pup, and a nice collection of cowboy boots. She has been passionate about art, especially jewelry design, for as long as she can remember. When she’s not traveling to teach, or treasure hunting, she is in the studio designing pieces that combine metal, gemstones, and unique well-loved treasures in unexpected ways. She is a nationally recognized instructor who loves teaching technique and design, as well as sharing insight into her creative process. She also enjoys teaching online workshops from her “Jewelry Works“ site. Her design work includes work done for Michaels stores nationwide, the Ice Resin design team and the Industrial Chic line of jewelry findings. Her jewelry and artwork have been featured in numerous books and magazines, including a feature article and cover for Belle Armoire Jewelry. You can see more of Deryn’s work at her blog, somethingsublime.typepad.com; her online workshop at somethingsublime.typepad.com/jewelry_works; and her online shop, mocknet.etsy.com. I recently had the privilege to teach at a wonderful venue in Stamford, Ct...Art is You. I had a fabulous, creative group of students (love you guys!) and Connecticut is a lovely place to be, in the fall. On our way from Portland to the Maine North Woods, we stopped at a little antique shop and I found this little lovely. She's all handmade, from her pretty painted face to her wonderful dolly clothing. Just look at this face! I wonder who painted her. I can only imagine how excited some little girl was to receive this amazing doll. Her legs have been lost, somewhere along the way but her clothes are pretty amazing. Her dress is hand sewn from black silk with an embroidered pinafore atop. Underneath, she's got several layers of eyelet and lace petticoats and tiny little bloomers. She's a sweetheart and I love how much care was put into her making. The metal box you see, above, was another find from that same shop. In it, I've kept my finds from the trail...we did a little hiking, even though the weather was cold and rainy. Fun stuff!